Growing up my family frequently enjoyed a breakfast of warmed pita bread dipped in tahini and date syrup. We called it the Middle Eastern Peanut Butter and Jelly. This is my gluten free version in the form of a smoothie. The tahini gives it a thick shake texture. I like to use organic Tahini from Whole Foods which is simply ground sesame seeds. It definitely has a unique taste and is worth trying if you haven’t. It’s most popular for being used to make hummus. If you are going to consider any of my suggested toppings try the ground nutmeg to enhance the flavors! Serving this smoothie cold is a must so be sure not to skip the ice! This protein packed blend was inspired by a Middle Eastern popular breakfast of warmed bread dipped in tahini and date syrup. 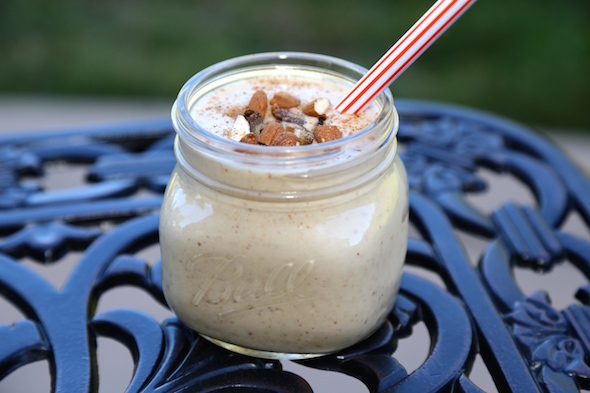 Blend almonds and water until almond milk is formed. Add bananas, tahini, dates, vanilla extract, and ice and blend on high speed until smooth (using tamper if needed). Add water for a smoother consistency if preferred. Pour into serving glasses and top each with chopped dates, almonds and sprinkle with nutmeg. *This shake tastes best cold and icy.